This recently renovated, 19th century townhouse is run by a mixture of globetrotters and locals. It’s like a home away from home. Between the knowledge and experience of our Killarney natives and our multi-national Black Sheep team you will not be left short of ideas for what to see and do while in Killarney. 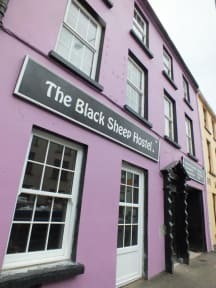 Situated on a quiet street just one minute walk from Killarney National Park and one minute walk from Killarney town centre you don’t have far to go for outdoor activities, live entertainment or a lovely pint. We’ll help you organise trips around Kerry such as boat trips on Killarney’s lakes, guided walks up the highest mountain in Ireland, bus tours around the famous Ring of Kerry and much more. Here you can also get in-depth advice on many walks, treks and cycles in Killarney and Kerry. Inside our hostel we’ve got the fire on for you in the evening if it’s cold in our super-cosy living room complete with communal guitar, chess board, games, record player and book-share shelf. There’s a fully equipped and homely kitchen with free pasta for the hungry, budget traveller. Then sleep sound in the timber built, pod style beds with your own light, power point, locker space and privacy curtain. Breakfast is included and consists of fruit, toast, tea, coffee, a selection of jams and spreads, yogurt and cereal and, if you’re lucky, eggs from or chickens. If you prefer to take it easy you can just chill in the hammock with our ultra-cool hostel dog BOB! He is usually found pottering around our organic vegetable garden trying to figure out where he buried his bone. Ótimo lugar, com pessoal bastante receptivo. Aprovado! !